Attendees at the Dogwood chapter’s Natural Bridge Rally in May 2017 had a great time; activities ranged from a tour of a wildlife park to a stop at a country store. The rally took place in Virginia. Virginia is the home state of this chapter, but members have traveled together to destinations as distant as Maine. The Dogwood chapter motto is “Fun, food, and friendship,” said chapter president Jim Buelow. And if you are an FMCA member in the Eastern Area, you may want to consider the ways joining this group will fit into your RV lifestyle. First, chapter members have voted to welcome owners of towable RVs as well as owners of motorhomes into the group. Second, if you’re still working, you will not be the only one. Jim said he works part time, too, although about 75 percent of the members are retired. If you have a weekday job, it helps that rallies normally run Thursday through Sunday. And when it comes to rallies, the chapter holds four to six each year. “Members do have fun at our rallies,” Jim said. “But there’s no pressure to do everything. You can just sit and socialize, play games, or just relax. Do what you want to do.” Rallies usually take place within a 200-mile radius of Richmond, Virginia. “We have rallied in the Outer Banks, the mountains, auto races, festivals — wherever the rally host would like to go,” Jim added. Then, in October, several of the chapter’s members continued their involvement as volunteers at the Great Eastern Area Rally (GEAR). The chapter doesn’t work as a group at the rally, but many couples have a longstanding tradition of helping at GEAR every year. They also put together a Dogwood chapter display at chapter fairs. The group’s very popular Christmas rally takes place the first week of December. And, since several chapter members spend winter in Florida, they have an informal rally there as well. 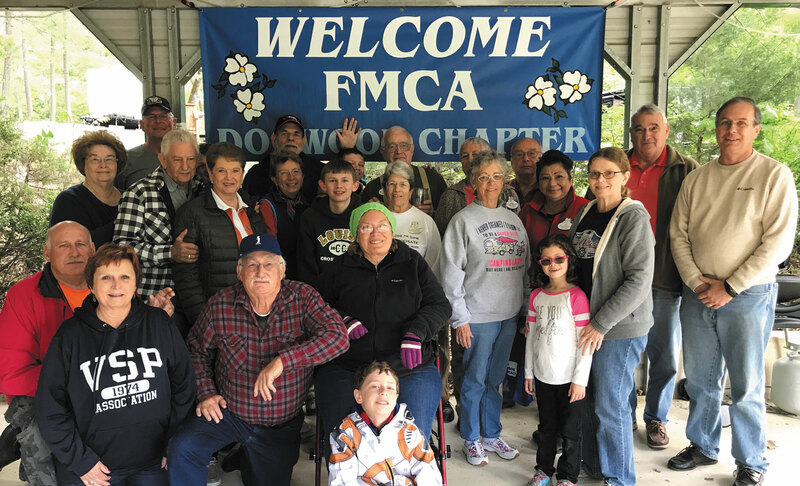 The Dogwood chapter has approximately 50 member families and welcomes new members. To learn more about the Dogwood chapter and its activities, take a look at the chapter’s online newsletter, “Dogwood eNews,” at www.fmcadogwood.blogspot.com. Or, contact Jim Buelow at (757) 876-7399; email jandsbuelow@aol.com. For general information about FMCA chapters, contact the Chapter Services Department at (513) 474-3622 or (800) 543-3622; chapters@fmca.com.